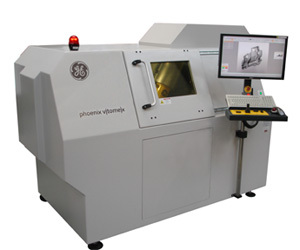 The phoenix v|tome|x s is a versatile high-resolution system for 2D X-ray inspection and 3D computed tomography (micro ct and nano ct)) as well as for 3D metrology. To allow high flexibility, the phoenix v|tome|x s may optionally be equipped with both, a 180 kV / 15 W high-power nanofocus X-ray tube and a 240 kV / 320 W microfocus tube. Due to this unique combination, the system is an very effective and reliable tool for a wide range of applications from extreme high-resolution scans of low absorbing materials as well as for 3D analysis of high absorbing objects.